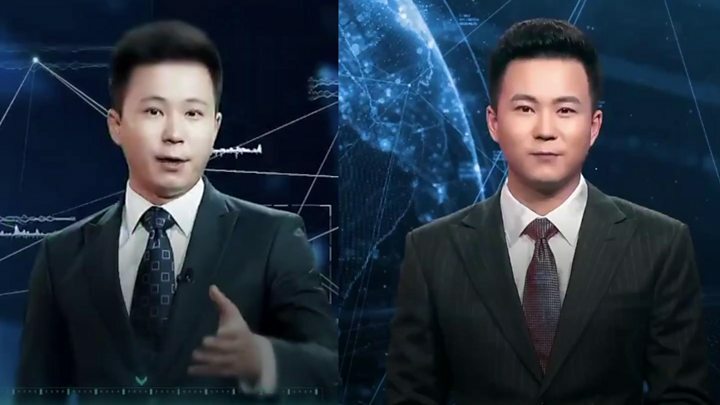 China’s state news agency has unveiled a virtual newsreader sporting a sharp suit and a somewhat robotic voice. Xinhua News claims the presenter “can read texts as naturally as a professional news anchor”, though not everyone may agree. “Hello, you are watching English news programme,” says the English-speaking presenter at the start of his first report. Sogou, a Chinese search engine, was involved in the system’s development. “I will work tirelessly to keep you informed as texts will be typed into my system uninterrupted,” says the presenter in an introductory video. There is also a Chinese-speaking version with a different face. Xinhua says the presenters can “work” 24 hours a day on its website and social media channels, “reducing news production costs”. The agency points out that they may be particularly useful for disseminating breaking news reports in a timely manner. An artificial intelligence (AI) system has been used to synthesise the presenters’ voices, lip movements and expressions. They are based on those of real Xinhua presenters. This is different from using a 3D digital model of a human. It appears that photo-like facial features have been applied to a body template and animated. The presenter struggled to appear completely natural, said Michael Wooldridge at the University of Oxford. It was stuck somewhat in the “uncanny valley” – a term used to describe human-like robots and avatars which seem subtly unrealistic. “It’s quite difficult to watch for more than a few minutes. It’s very flat, very single-paced, it’s not got rhythm, pace or emphasis,” Prof Wooldridge told the BBC. He also pointed out that human news presenters have traditionally – in many cases – become highly trusted public figures. “If you’re just looking at animation you’ve completely lost that connection to an anchor,” he added. It was a “good first effort”, however, said Noel Sharkey, emeritus professor of artificial intelligence and robotics at the University of Sheffield.